Set of three silver plate spoons in their original box, made in England in circa 1870. Measures: Big spoon length 23 cm Small spoon length 18 cm. Pair of serving spoons made in England in late Victorian period, in perfect conditions. Length of a spoon is 23 cm. 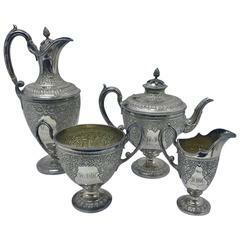 Particular tea set by Martin & Hall, made in England in 1898, good conditions overall, initials and date in front of each piece. Marked, nice engraving. 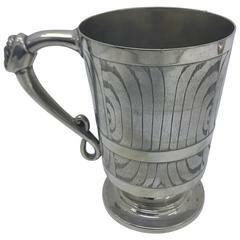 Unusual English mug, Victorian period, marked with diamond registration mark, engraved like a tree root, with un head on the handle. Amazing quality and perfect conditions. By John Round & Son Ltd.
John Round & Son Ltd. Particular engraved bottles cruet made by John Round & Sons LTD between 1880-1896, crystal bottles are in perfect conditions. Victorian three-branch silver plated centerpiece, with Pegasus and Ram decoration, Registration Mark on base for 2 February 1861, Weighs 3.4kg, 120 ounces. A lovely tea caddy - beautifully aged - use as a tea caddy or to hold notes, supplies or jewelry? We love the patina and the lions heads handles. English Victorian silver plated and cut-glass mechanical purse motif table box, with dual lift sides on a finely cut-glass purse shaped base, Unmarked. Decorative silver plate biscuit box circa 1900 with delicate handle. Each bowl has a hinged flap with pierced sections which clasps together at the top.